This is the full version of the Hanes T-ShirtMaker deluxe Software. The product is the software CD only. Thousands of ready-made designs created by professional T-shirt design artists. New Color Picker allows you to choose up to 16 million colors for advanced color matching capabilities. TrueTransfer™ Technology an exclusive patent-pending print technology that gives you perfect photo transfers every time. Fantastic Photo Fun with Deluxe's photo tools. Pick any photo-- it's a snap to drop your favorite photo into hundreds of photo-ready design. 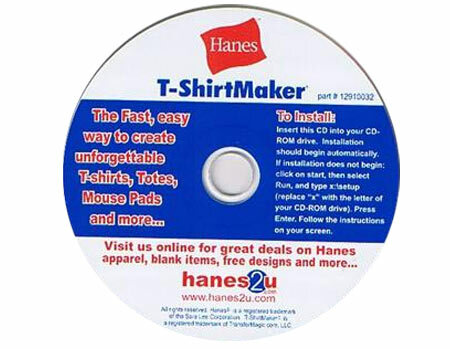 Hanes T-ShirtMaker is compatible with 32 and 64 bit Windows Operating systems: Windows 7, Vista, XP & 2000. NOTE: This software will not work with sublimation inks! Learn about dye sublimation.